The BMW Z4: Ready to take on Mercedes-Benz. BMW is replacing the Z4 coupe and soft-top roadster with a single model that has a retractable two-piece hard top -- a feature that will position the new Z4 better against luxury competitors, says Jim ODonnell, CEO of BMW of North America LLC. When we introduced the previous-generation Z4, we missed the mark a bit, ODonnell says. The original Z3 roadster, which debuted in 1996 at a price under $30,000, had a fabric roof. It was more affordable because we had four-cylinder engines back in those days, and it reached a mass audience, ODonnell says. The new Z4, which was scheduled to go on sale Saturday, May 9, is positioned spot-on against the Mercedes-Benz in the marketplace, ODonnell says. 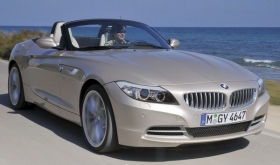 The Z4 is available with two inline six-cylinder engines. The base model sDrive30i with 255 hp starts at $46,575, including shipping. The previous Z4 roadster was priced at $43,175. U.S. sales of the Z3 peaked at 20,613 in 1998. The Z4 topped out at 20,169 in 2003 but fell to 13,654 in 2004 and plummeted to 5,879 sales last year. U.S. sales of the Mercedes-Benz SLK were 4,941 in 2008. In a down market, the roadster segment is one of the most difficult, ODonnell says.